Arugula is also known by the name rocket, which to many describes its unexpectedly peppery and dark green punch that can become strangely addicting. A very beautiful leafy green, it’s related to watercress, both members of the mustard family, explaining their shared peppery punch. Arugula is low in calories and packed with chlorophyll phytonutrient goodness, vitamins A and C.
– Always wash your arugula well before eating. Best to swish in bowl filled with cool water, then transfer to a spinner to dry or dry with paper towels. – When using in salad, like all salad fixings, it’s important to dry first so that it will be able to take on the dressing flavors well and keep excess moisture out of your salad. – Arugula has become quite the popular pizza topping – throw on a few washed leaves in the last minutes of baking or reheating. – It makes a nice green and peppery addition to a sandwich. – Arugula is also tasty and visually beautiful slightly wilted in an omelet or fritata, pasta, or as peppery bed for main course. Look for very green leaves, free of yellow or brown. Avoid bagged arugula with to much moisture, you will see signs of “melting” leaves. Arugula bought in bags are most likely baby leaves. 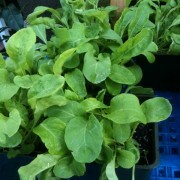 Arugula bought in bunches are most likely mature and need to have its tough stems removed before cleaning. To keep arugula for up to 6 days, best to clean before storing. Here’s a suggested method: In a large bowl or basin of cool water, gently circulate leaves in the water, allowing dirt fall to the bottom of the bowl. Transfer clean leaves out of the water and to either a salad spinner, a clean kitchen towel or layers of paper towels. Dry leaves in spinner or by rolling in the towels. Transfer leaves to clean paper towels, gently roll them up, store in plastic bag loosely open, in the refrigerator. Unwashed arugula will keep in refrigerator in plastic bag for up to 2 days. Arugula like a number of other edible herbs being grown in personal gardens in the ancient times, had a lively reputation. It was cited by more than a few classical authors as an aphrodisiac. Even Virgil had something to say about it: “the rocket excites the sexual desire of drowsy people.” For this same reason it is said that arugula was forbidden for growing in the gardens of monasteries.